Again, nothing is for sale yet. I am going to be short on pieces up in Ohio. There are a couple of reasons. 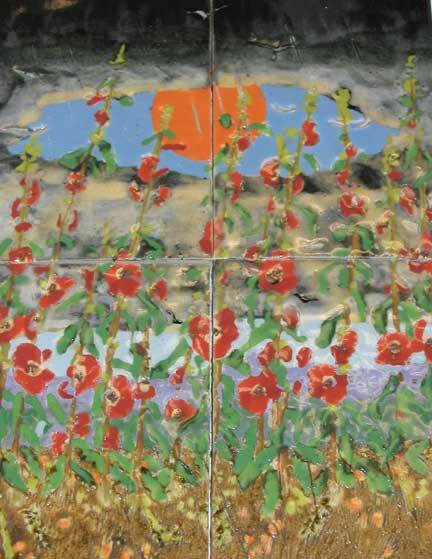 One of which is that I have spent too much time on tile panels that won't be ready for Zanesville. I'll show you some of the panels down below. The problem is that I do not have the time to make the frames so they will have to wait until the fall. But there is hope. I have made some beautiful pots and I still have a solid three weeks. Some of these frogs- pictured here being loaded for the bisque- will hop up to Zville. 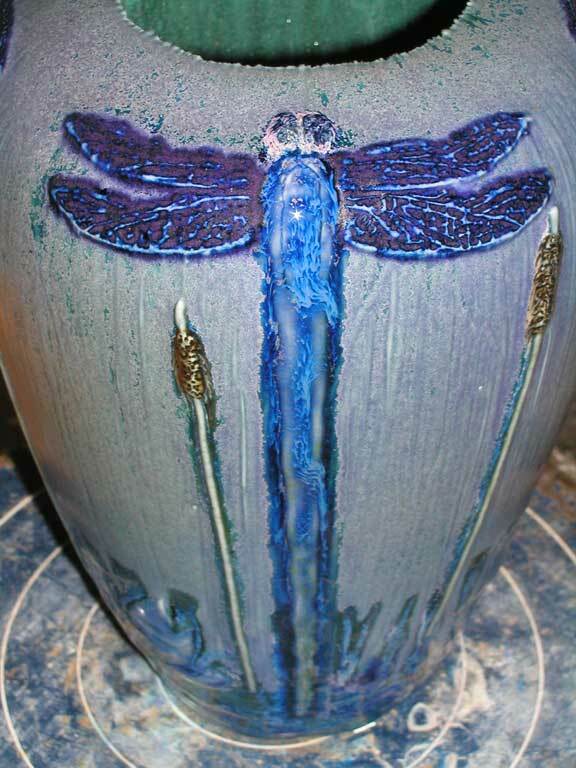 Back by popular demand will be a few Dragonfly pots. I have been getting adventurous with the glazing. 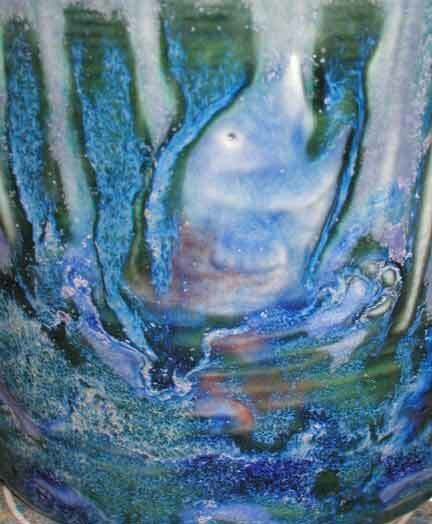 Here is a detail of the bottom of the pot pictured above. 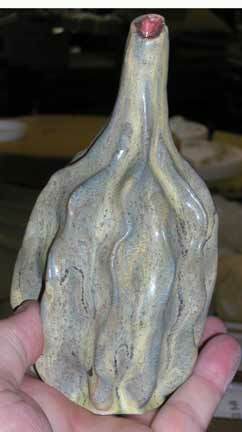 A group of pots glazed at the same time. The rain pot in the front is a treasure. The back has bolts of lightening streaking down the pot. Something new. 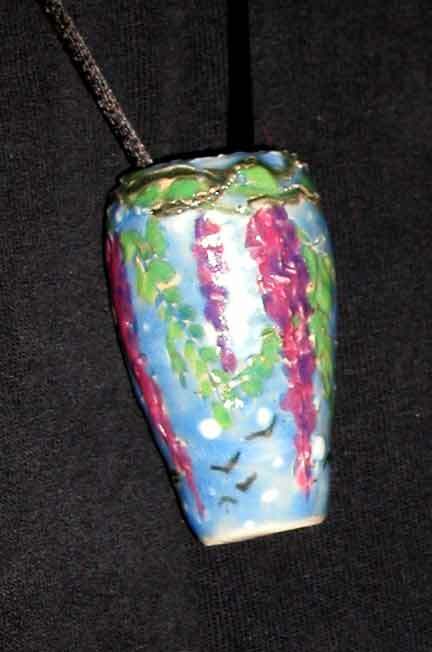 Tiny pots, some of which are jewelry. and another tile that is my first and only advertising panel. It is one-of-a-kind. I have made three gourds that turned out nice. I will be working late into the night. I will have one more update before Zanesville and it will show what is coming up. There are still a few surprises to be seen.